In today’s networked audio transport systems, there are numerous requirements for various input and output combinations. One location of your audio network may need to capture 16 microphone signals, while another area may only require that 2, 4 or possibly 8 channels of audio be converted back to the analog world. There may be locations in your networked audio system where AES/EBU inputs and outputs are the ticket. 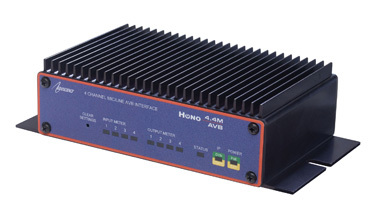 Whatever your need, the Hono™ AVB Family from AudioScience provides the largest variety of I/O combinations in the networked audio transport industry today, period. These devices have been purposely designed to compliment and fully integrate with all of today’s AVB compatible DSP products. In addition, this is the ideal solution for many situations where a project requires numerous channels of digital audio routed throughout a facility, but doesn’t require a large dedicated DSP product. The Hono™ AVB Family from AudioScience: Networked audio transport technology in a powerful and versatile package at a very attractive price. Click on the links below to learn more about each series.